I’m starting a little mini-series called “Week of Tees” today. I already talked about how I spent a week using up my pile of knit fabric. As a result, I now have six new shirts, five of which will make it to the blog (number six is just a plain black tee). 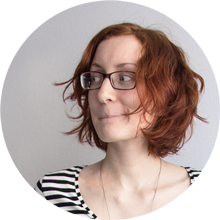 So this week, I will blog about a different shirt every day. 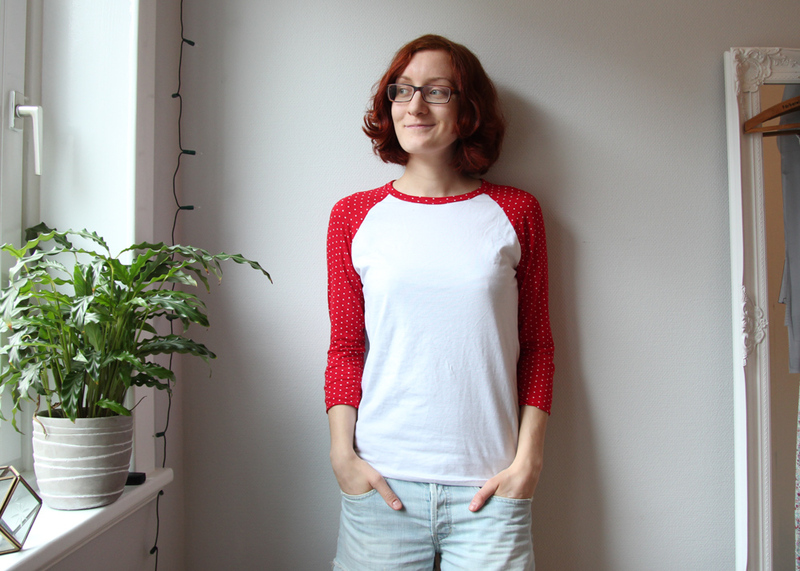 I worked with two patterns as a base: The Deer and Doe Plantain T-Shirt and the Built by Wendy Baseball Tee from her book “Sew U Home Stretch”. Today’s shirt uses the baseball tee pattern. As I mentioned before, I love a mix of “feminine” and “masculine” elements when it comes to clothing. 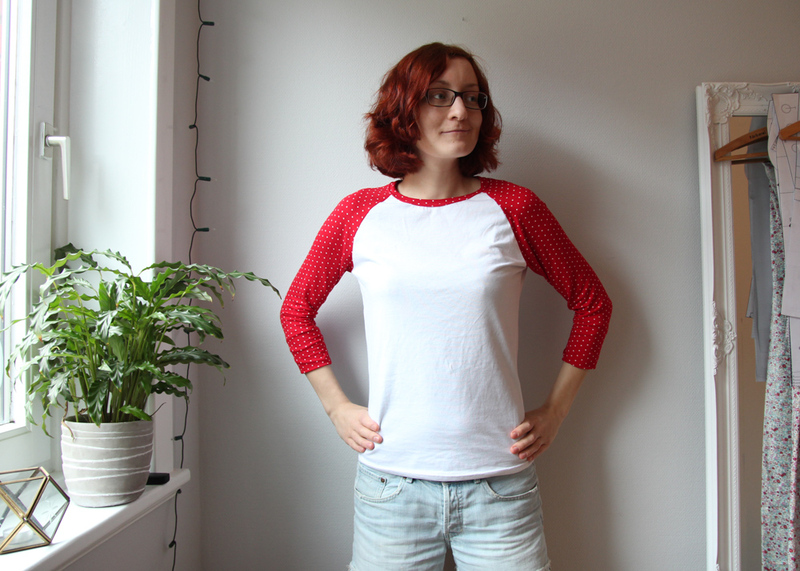 So the baseball tee cut combined with the more “girly” polka dot fabric was exactly my taste. 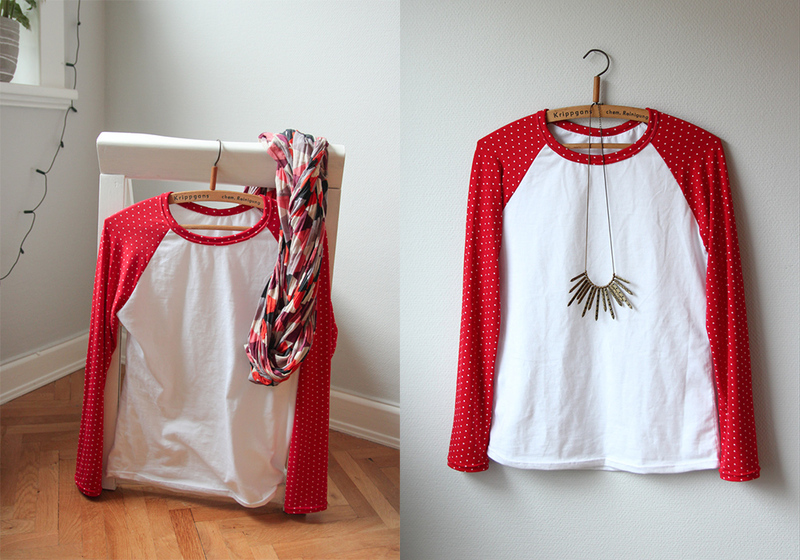 On all five shirts, I tried different methods for sewing the neckband. This one is the bias bound method. Rae has a nice tutorial on that (She uses a serger while I just used one of the stretch stitches on my sewing machine and did the topstitching using a twin needle). I am quite satisfied with this shirt, yet next time I would change the width of the neckband. It turned out kind of thick and makes it look a teeny tiny bit too kid-like. I will shorten the sleeves to a 3/4 length for the same reason (they’re just rolled up in the photos). Make Again? Yes! It’s great for using up remnants that are not big enough for an entire shirt. But for now, I don’t have any more knits left in my stash and that’s a good thing. On a totally different note: Don’t let the pictures fool you – it was 2°C in our part of Germany today. So although I am wearing shorts and that light shirt, I immediately changed into warm tights and a sweater after shooting these photos. It’s still far too cold for a shirt like this right now, but it will probably get a lot of wear in summer. So that was tee number one. We’ll get to tee number two tomorrow.